During the October exhibition of 2006 in Tuomen, Color, Sound and Aromas have been used. It was attempted to view each Morugin’s painting accompanied by sounds of a certain music work with preliminary comments given. I’ve selected the music guided by my inner feelings. In the result, those people who have shyly approached it for 2-3 years all over sudden have started to read the books of Rerikh, Rikla, Blavatskaya with passion and understanding. We have also to play music for a long period, so the person in the hall started to understand his problems, which prevented him from moving ahead. Some people closed their eyes for the first time to see – the pictures, symbols or light. 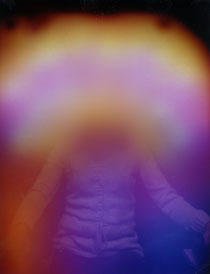 And namely this combination of color has been seen at the aura photo made after the meeting (photo1). Rose – makes forget everyday problems and to bring you in your thoughts to the pure spheres of Being. Sandal – is the meditation aroma. It enables to enrich one’s Spirit and Energy, to reach the harmonic fusion with the surrounding world. 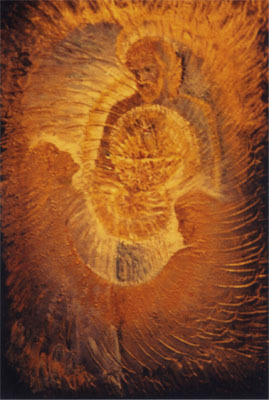 The picture “Fire Giver” was painted in 2005 and the same year it was first seen by the people of Odessa. The main color of the painting was dense blue-violet. Having started to read the books “Fire of the Unified Cosmos”, the author has risen to a new stage, the growth is clearly seen in the last year. The book became an everyday reading without any doubts or misunderstanding. “I accept everything” – was the answer to the question about accepting the book 2006 and the first meeting in the artist’s workshop, the joyful eyes inviting to see the changes in the picture “The Fire Giver”. I have asked: “Valeriy Mikhailovich, have you repainted the picture?” Usually a very measured author all over sudden got fussy, trying to move his work to a dark corner, turning it away from the light. The picture shined! And there sounded the explanation – “Having taken the first books, I have felt complete trust, understanding and the Energy. There you are, the scale and the vigor of the Energy – frightened and as the result, the picture was of dark-violet color. The fright has passed – the color has changed and it shined, but I didn’t even touch the picture”. Now the original of the picture “The Fire Giver” is in Odessa, it stays with a very sensitive woman of great inner beauty. Speaking about the demand for the pictures. One can beg for the picture for a long time (that I has been a witness to), and the author having patiently looked at the person would point at the other one to him, saying: “Here is your picture”, or upon having listened to the two claimers and having looked them up attentively, he will tell one of them: “This is for you”. Yes, every work of art promotes the accumulation and exchange of energy and fills the space. Knowing about such possibilities of energy, it was suggested to the people, who have made the aura photographs and who have seen the depth and scales of the problem to refuse from the usual visit that takes place in such cases. I have persuaded to work on one’s own at the exhibition, where they will be provided with the “instruments” for solving the problem and for filling up the aura, but the work has to be down all by oneself. 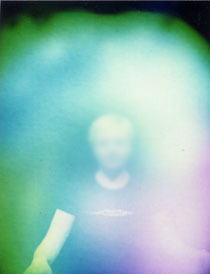 Photo 4 – the aura is not whole and of low vibration. The condition of the person – is increased irritation and vulnerability. The people around will be aggressive towards such a person. After every meeting where conversation, music, aroma took place, the person experienced symptoms of purification already familiar. 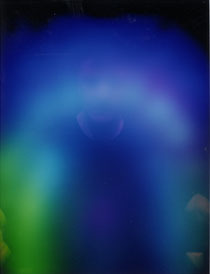 He experienced vibrations and movements at the lower energy centers area and this resulted in the yellow color of the aura (photo 4). There appeared a wave from above, characteristic for a whole aura. This person took part in conducting of the exhibition in the autumn of 2006 in the city of Tuomen. There was an attempt to destroy the physical carrier. Having felt the energy impact in the area of the heart, he rushed through all of the city ignoring the red traffic lights and having stepped over the threshold of the “Adamant” center, he fell. In two hours time photo 5 was made, when the symptoms have almost passed. The following photos 6,7,8 have been made after having stayed in the space, where the exhibition was assembled and then at the exhibition itself. This person can’t meditate, he simply calms down. He stayed at the exhibition for 30 minutes, no more. 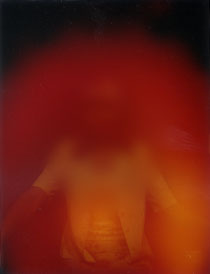 At the photo 5 – in the center of the aura one can see total absence of energy – this is the energy impact itself. 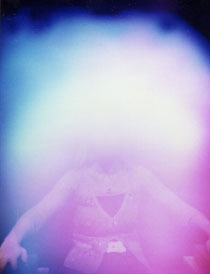 Photo 6 – the aura at the periphery livens up again, being filled with energy. In the zone of impact there is the dark-rose energy of the Mother’s of the World Ray – it is the first to appear when the violence is done to a person. But the left angle is still dark and this is a threat to the future. 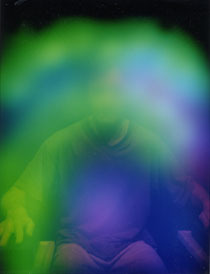 Photo 7 – the set of the psychic energy is being strengthened, the yellow color has appeared and the left angle is lit with green – the danger has passed. 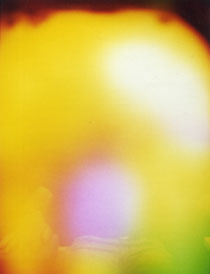 Photo 8 – the yellow color became pure and there appeared the White spot, pointing at the Source. 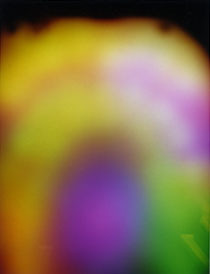 The rose color in the center of the aura got pure and has shined as well. The Aura has been restored completely. There are only six originals in the city, but there are more of those who wish to have them. Knowing that there is equipment in Tuomen, which prints the reproductions on the artistic canvas, it was decided to use the help of the machinery, because very interesting latest period works of Morugin remain packed in Kherson. By that moment he has lost his workshop and the exhibition hall and because he lives in a small flat, there is no possibility to exhibit all his works. There was a feeling that it is very important to print the reproductions having approximated the size and color to the original at the maximum. I’ve guessed that the machinery is capable of many things, but that I didn’t expect. If one is unfamiliar with artist’s painting technique, then at a first glance one can assume that this is canvas and oil paints. The Adamant center has an experience of how the reproductions of Rerikh “act” – they come to life! That’s why we have tried an experiment and weren’t sorry for it. We transported the reproductions out of the printing shop, using a small vehicle, and on the night before the exhibition, which the car owner wished to visit very much, the license plates were torn out together with the bumper at the guarded parking place. Instead of self perception and meditation, the woman had to spend all the day at the police station. Namely on the very first day, after having visited the exhibition the third part of the participants have gone to bed with the symptoms of encounter with fire. Among those people there were a lot of newcomers, part of them didn’t come back to the new meetings. They came to be healed, but they have faced some strange pains, plus the information that “makes your brains melt” (such was the expression of the visitor of the exhibition “The healing power of Art”). Later, people said they’ve experienced strong cold and chill, it was impossible to get warm neither in hot water, nor under a pile of blankets. People bring water to such meetings, to spray it over at their homes later on. During such spraying at home there appeared two colored rainbows of bright-rose and salad colors. Namely this occurred at the house, where opinions about the exhibition got divided: between skeptic and full trust. To a person, who thinks about the influence of energy on human being and objects, the following was demonstrated: the television set started to transmit in slow motion, then the sound and vision have disappeared and the screen having been divided into two parts, got same bright-rose and emerald-sapphire colors. The person was surprised by the brightness and density of color, because this television set was not remarkable for such color transition before this event. An interesting thing happened with the picture “Fiery Trinity”. After the exhibition the author has allowed to make the photos of the favorite works. A person came up to make a photo of a painting that has made most response, but the camera refused to work. Though a few moments before it has worked faultlessly. Not moving from where he stands, the person makes a second photo, during the print out he will be surprised by the color of the work. To be sure he takes a third shot, but the third photo is this very painting in the habitual color solution. Many people already know how much more sensitive is the photo equipment in comparison with our eyes. But it is not necessary to see this with camera, one can do it through his spiritual vision. 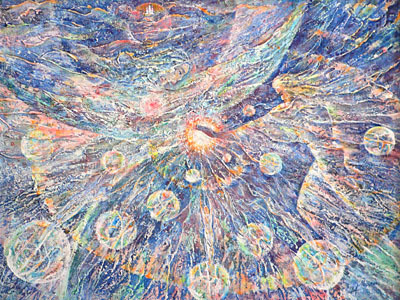 Comment: The flow of energy from the painting “Fiery Trinity” has been so great, that the camera failed. Sometimes the camera refuses to make pictures due to the fact that this can be seen only momentarily or only due to the people who are present. I can’t ignore the question which faced many people wishing to visit the exhibition. The point is the following: though the exhibition was conducted only on weekends, many people were faced with very important social business affairs and they’ve had to make a choice between the self perception and social problems. The first wasn’t necessarily the case, because it demands efforts and not every person is able to withstand the incredible pressure of friends and relatives. And also, if one has nevertheless visited the exhibition, and also has taken his relatives with him having persuaded them that this is very interesting and important. Who will answer the question – why the people who didn’t like the paintings, classic music and quotations of Rerikh and Rikla (clarifying as it seems to those listening their own situations) are so enraged? Not even an anger, but burning rage. Are we enraged, if we are invited to a movie, but we didn’t like the film? We are not saying in a common everyday situation, that we’ll never forgive those hours crossed out of life (this is what one girl has told to her mother. Or a son hangs in protest some people armed to the teeth, whom he has clipped out from some magazine opposite to the reproduction of Rerikh, acting hysterical and demanding from mother to remove that. What is this? The Light? The Purity? Yes, namely those qualities invoke, no matter how sad it may seem rage of some young people. By the way, in both case these are low frequency, not whole auras which indicate at ignorance of a high degree. And the attempt of the people close to present the possibility to attain the knowledge, end up with such reaction. 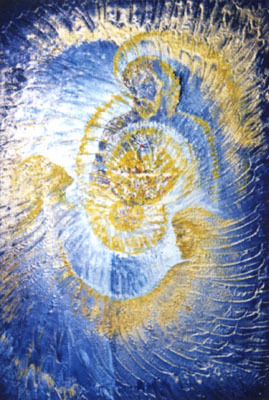 And if something is not understandable and there is no will to understand, then the tag of sect is given and the shout is voiced: “Don’t you dare to visit them!” Many people in Tuomen already have such a tag, this is even discussed in the society and is brought to the information of those who do not know. I wish to every person, who saw the real face of his “relatives” and “folks” not to lose the eloquence and strength to move ahead. Внимание! С правой руки смотрящего на фото ауры – левая часть ауры фотографируемого.